On Mechanism in Hegel's Social and Political Philosophy examines the role of the concept of mechanism in Hegel’s thinking about political and social institutions. It counters as overly simplistic the notion that Hegel has an ‘organic concept of society’. It examines the thought of Hegel’s peers and predecessors who critique modern political intuitions as ‘machine-like’, focusing on J.G. Herder, Friedrich Schlegel and Novalis. From here it examines the early writings of Hegel, in which Hegel makes a break with the Romantic way of thinking about ethical community. 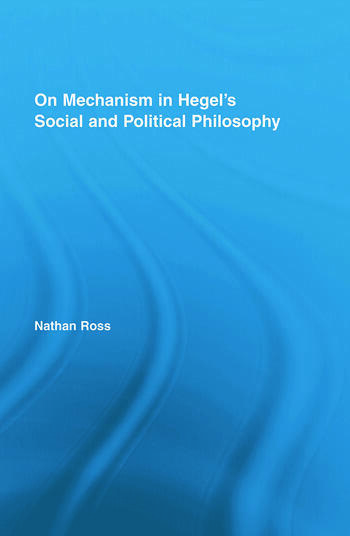 Ross argues that in this period, Hegel devises a new way of thinking about the integration of mechanistic and organic features within an organizational whole. This allows Hegel to offer an innovative theory of modern civil society as a component in ethical life. The second half of the book examines how Hegel develops this thought in his later works. It offers an in depth commentary on the chapter on mechanism in the Science of Logic, and it demonstrates the role of these thoughts in Hegel’s Philosophy of Right. On Mechanism in Hegel's Social and Political Philosophy offers a critical response to debates over communitarianism by arguing against one of the central figures used by scholars to associate Hegel with communitarian thought, namely the notion that society is organic. In addition, it argues that Hegel political theory is deeply informed by his formal ontology, as developed in the Science of Logic. Nathan Ross is currently on the faculty at DePaul University, and his work as a scholar is concerned with researching the social and political philosophies of Kant, Hegel and the German Romantics. He has published articles in Hegel-Jahrbuch, Idealistic Studies, and is currently researching the political implications of the theory of aesthetic experience in Kant, Schiller, Friedrich Schlegel and Hölderlin.